Joan Miro was born in Barcelona, Spain, on April 20, 1893, the son of a watchmaker. From 1912 he studied at the Barcelona Ecole des Beaux-Arts and the Academie Gali. In the first quarter of the 20th century, Barcelona was a cosmopolitan, intellectual city with a craving for the new in art, music, and literature. But, it was not the place where great art was being made. That place was Paris, and Miro established himself there at the age of twenty-six. He made friends with Pablo Picasso, Alexander Calder, Ernest Hemingway, Max Ernst, and Paul Klee and was accepted as a Surrealist, looking stronger as the years went by. He lived alone in Paris in total poverty, but every time he went out, he wore a monocle and white spats. He kept his brushes clean, waxed and polished the floor of his studio, and arranged his canvases in neat order. Miro went about his career with orderly determination. He wrote to Picasso in 1929 that he was looking for a studio, a dealer, and a wife. That same year he married the daughter of family friends. Her name was Pilar Juncosa, and they were happily married and were together for fifty-four years. They had one daughter, Dolores. Miro was certainly the most distinguished painter of Catalonia; he was intensely proud of that fact. All of his work was conceived in Montroig (the site of his family’s farm). Most important of these was the painting named “The Farm” which did not sell in Paris and was finally sold to Ernest Hemingway for $250. He was the most enduring of the Surrealist artists; he first visited the United States in 1947 to execute a mural commission at the Terrace Plaza Hotel in Cincinnati, Ohio with Alexander Calder. His reputation had preceded him, and he had already had enormous influence on such American artists as Adolph Gottlieb and Mark Rothko, who had adopted his Surrealist automatism and mysterious primitive symbols for their own purposes. 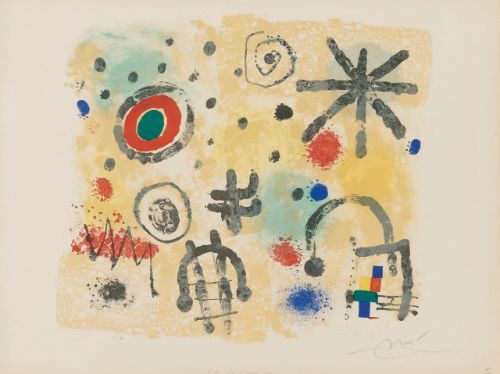 Miro had tried his hand at ceramics, bronze sculpture, printmaking, book illustration, posters, costume design, etc. He was seventy-nine years old when he began his series of monumental bronzes. When he was eighty, he joined forces with a young Spaniard named Josep Royo who was a weaver of tapestries. Miro would spread Royo’s tapestries on the floor and design changes, adding all kinds of materials, painting some areas, even burning areas. The result was a series called Sobreteixims. Miro transformed the Royo tapestries from admirable folk art into perhaps masterpieces. He died on Christmas Day in 1983 in Palma Majorca, where he had lived and worked for several years.